All Braheim Fowler wanted for his birthday was a baseball bat. The 12-year-old Philadelphia player for the Taney Dragons actually thought his father, Devon, had forgotten to get him a gift. And like most kids, he was a little salty. But his sadness didn't last for long. 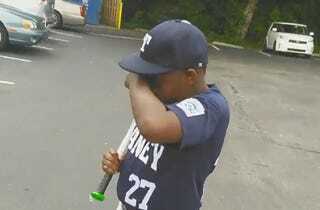 In a now viral video, dad Devon surprised his son with a brand-new bat on their way to a Little League game. When his dad asked Braheim why he is sad, the preteen kinda shrugged it off—that is, until his father handed him a box.